There has been plenty of buzz around this new high end “professional” scope. Yes, the main audience for these scopes are the pros and the scope is built to accomodate their very demanding needs. With some already in Service, the reports have been glowing with the typical response being…. “SEND MORE”. I recently had the pleasure of viewing my first TT scope. This was a customers scope so only got a short look but what I saw was impressive. 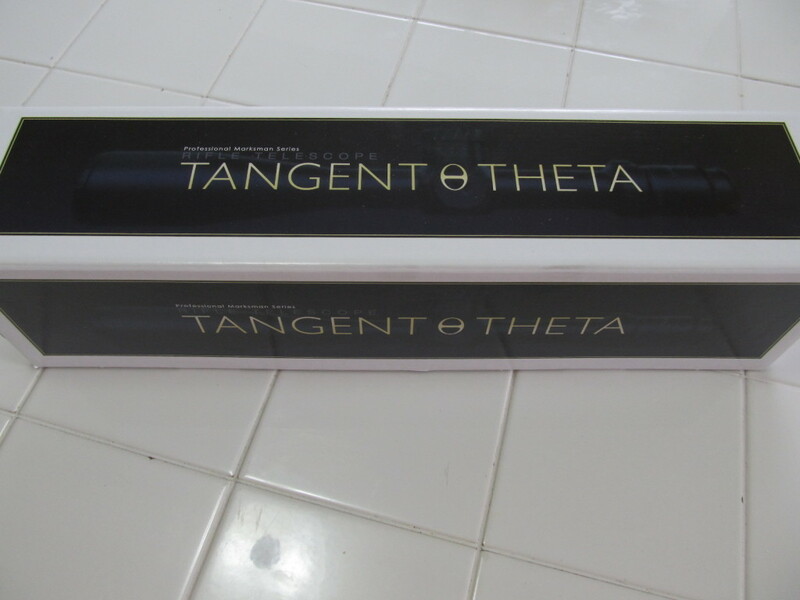 The scope is well packaged and includes some very nice Tenebraex flip covers and ARD. These covers are very pricey but built to last and have nice features not found on the typical Butler Creek covers which have a tendency to break under moderate use. The ARD is the real deal. Very well made and should make you IR safe. Complete instructions and a nicely laminated info card on the reticle subtensions which will be handy for field reference. No tools are included in the box…. we will get to this later. This is a full size scope. 34mm and has some heft to it. Typical of this gendre, there is no doubt you are picking up a scope made with alot of quality material. Alum tube and very nicely, evenly finished. 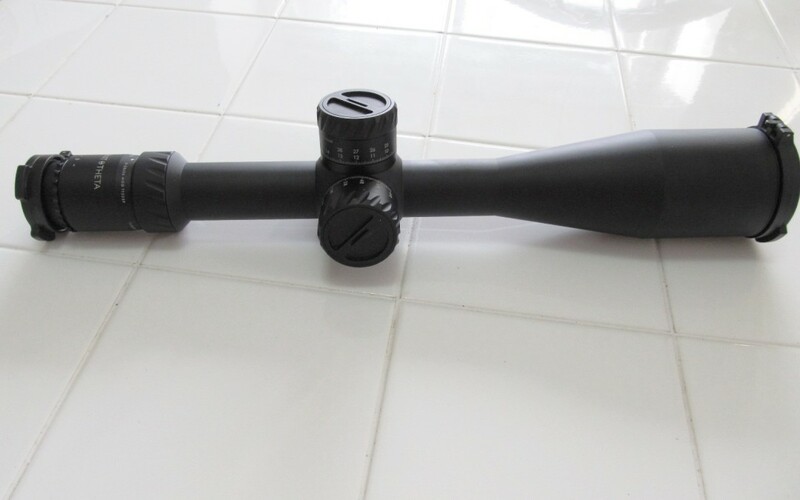 The matte black is the same colour as we find on pretty much all popular better made scopes. All moving parts are manf with the very best materials and tested to hold up for a lifetime of use. All the controls are where you expect them on a scope. Everything moves smoothly and all feels very well manufactured. Many have commented on how good the elevation and windage turrets feel and I have to say, their right. The clicks are very clear and each step is very precise… like a quality watch, each click brings the next line perfectly aligned with the index on the scope. The sizing of the turret is low and wide with some very nice shaped scallops on the top. Very easy to use and never felt like you were going to slip or that you were going to loose some skin during use. There is nothing sharp anywhere on this scope. Handgun shooters will call this properly “dehorned”. Now the part that I love and many may go “huh”… the scope is SIMPLE. There are no extra knobs and lines and plastic bits here and there. The scope is pure function. Only what you need to operate a scope. Only the functions that matter in a scope. Everything is intuitive to use…. no I didn’t bother reading the manual as it all made sense immediately after taking out of the box. Anyone with any experience with a scope will feel right at home and this can be very important when training or when real “stress” is in the mix. Simple is GOOD. Markings are easy to read and there is no question on operation. The elevation is a two turn unit with a steel pin that protrudes after the first rotation. The windage is a 1/2 turn left or right before it stops. With the amount of travel in either direction, you will be in a tornado before you need more adjustment so this makes sense. The fast ocular adjustment is locked by that scalloped ring. Simple and very effective. Plenty of diopter adjustment to work with pretty much anyone. Finding the correct reticle focus for me took only a few seconds. Then the ring is tightened and the setting is fixed. The mag ring is clearly marked and moves smoothly with enough resistance to not get moved accidentally. I never felt the need for a mag ring lever. The one truly innovative feature is the toolness turret rezero and zero stop. You can use your fingers on that tab on the cover to loosen the cap, rezero the turret, tighten the cap and its done. Takes longer to type this then to do… I mean I have never seen anything truly this simple. And the zero stop is automatically repositioned to function and it functions precisely each and every time I moved the turret and/or played with the rezero function. I know how hard it is to engineer simple and this one must have been a real head scratcher. Truly worthy of a patent pending design me thinks. WRT to the zero stop on the elevation, the turrent stops EXACTLY 5 clicks past zero. Not 4. Not 6. Not some mushy must be it feeling. You hit a “wall” at 5 clicks each and every time. This setting holds no matter where you set the elevation turrent.. somewhere on the first rotation, somewhere on the 2nd rotation, just doesn’t matter. When you dial back to the zero, you have 5 clicks then you stop. Done! Simple! DEPENDABLE! With the splendid ease and simplicity of set up plus how well it works, this is a zero stop I can actually get interested in. 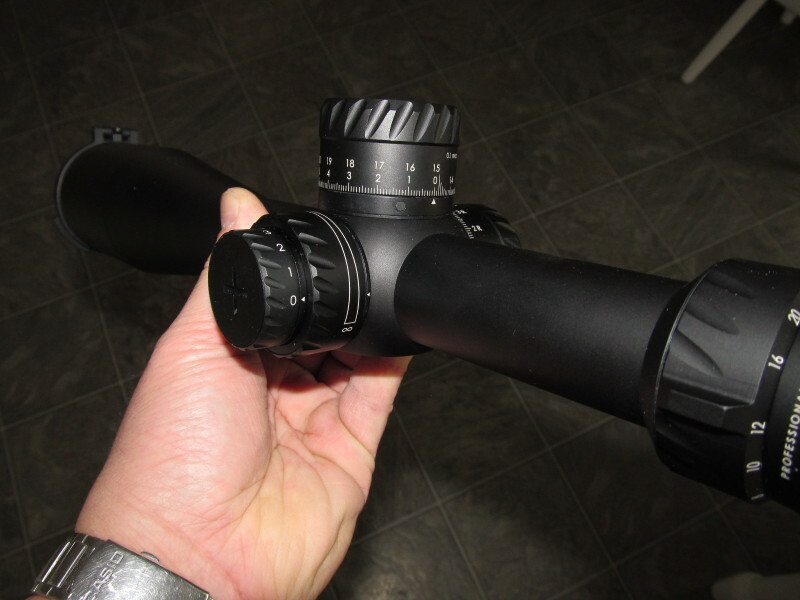 I had a chance to compare this scope with a S&B PMII of similar mag, a high end Swaraovski variable hunting scope at 30X, a NF NXS of similar mag and a Sightron SVSS 10-50X60 set at 25X. It was a cloudy overcast grey day… very dull lighting. We were looking at a rock wall and sitting bench WAY past 2000m. The clarity and resolution of the TT was immediately obvious. 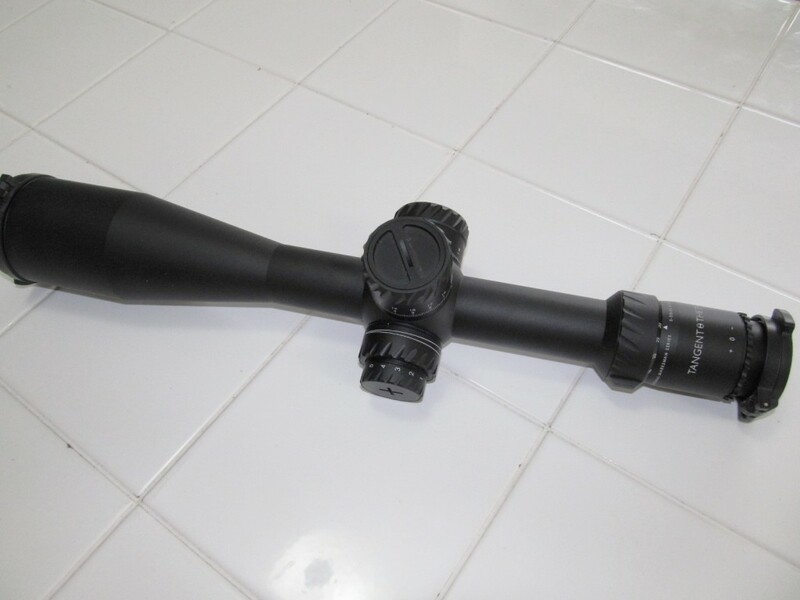 Throughout the travel of windage and/or elevation, there was no detectable change in what you saw through the scope (some “high end” scopes tank when the travel is pushed into the corners). 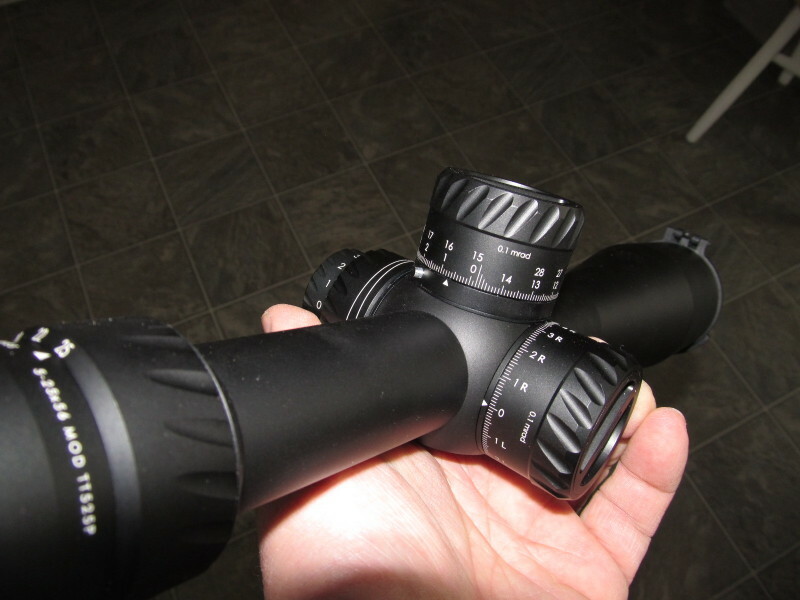 The eye piece was easy to use and eye relief was longer then the S&B….similar to the SVSS. Side focus was smooth and again, easy to use. The reticle intensity knob was larger in diameter and thickness then I would have liked but I am sure you would get used to it. Once the side focus was set, we never adjusted it again….nice! Clarity and resolution between the TT, S&B and SVSS was a toss up. Brightness and colour were also pretty much a wash. We could easily see small gravel rocks that were likely as small as a golf ball. Plenty of fine detail in the rock wall and we could even see the spray from a small waterfall in a crevice. 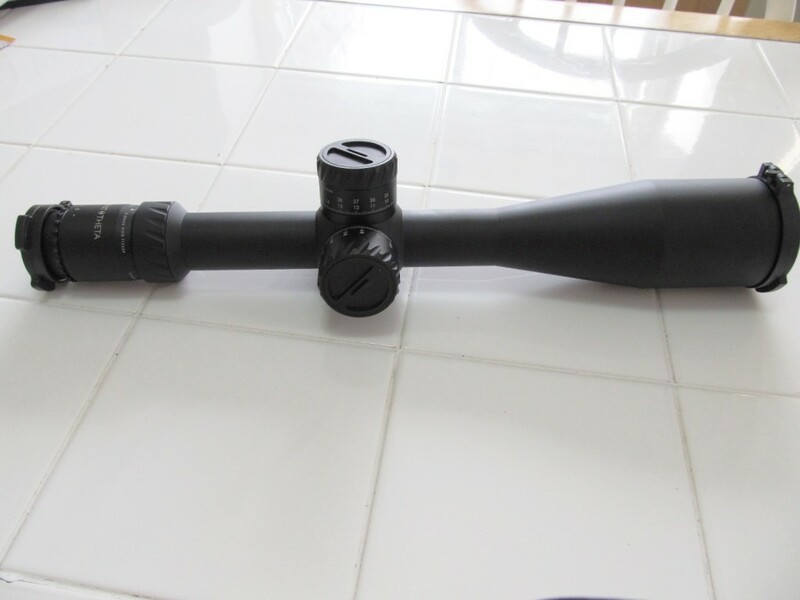 The sitting bench has a 3″ wide frame and these scopes had no issue seeing the lines very clearly and you would have no problem aiming on a coke can if one was sitting on that bench. The NF was slightly behind in clarity and resolution. The Swarovski was a good step behind and it was hard to define the rail…. no problem seeing the bench but fine aiming was beyond its capabilities at that distance. Without time to mount on a rifle and view targets, I can only say my first impression is very positive. Comparing so well with proven performers like the S&B and Sightron SVSS, I know the glass will hold up during shooting. 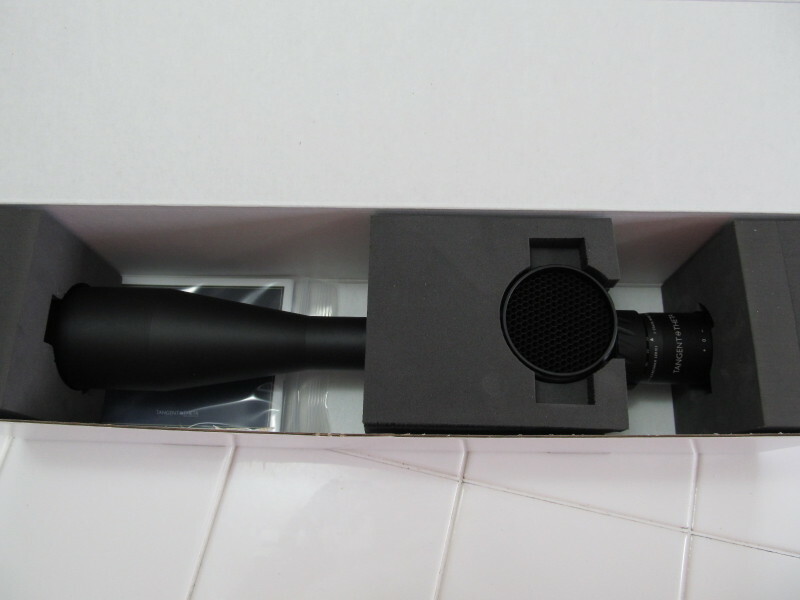 Sorry, no tracking or repeatability tests as this scope was repackaged and off to one very happy customer. 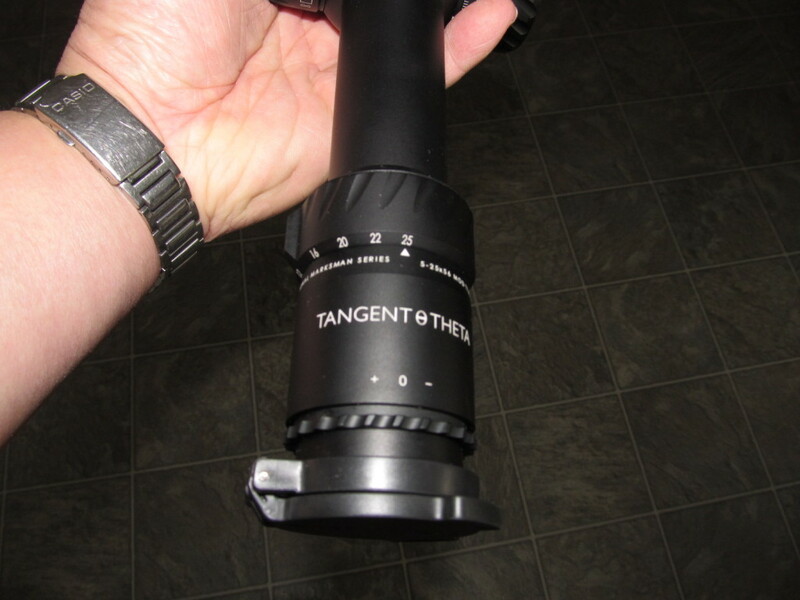 Demand has put the TT scopes in backorder with orders taking 8 months or longer to fill. Yes, it is a long wait but for the leading edge in professional optics, many customers seem to think it is worth both time AND money.